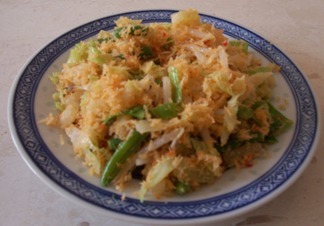 Indonesian Vegetable salad or Urap in Indonesian is an authentic Indonesia food. This is really an old dish of Indonesian recipe. But this recipe is still a favorite for many people. Maybe it’s because of the fresh taste of the vegetable in combination with seasoned grated coconut. For Indonesian people this is also the most common dish. It’s very cheap to make and you don’t need special skill to make it. It is very easy to make. If you are vegetarian, this is an excellent choice for your dinner. I’m sure you will like this oriental recipe. It is healthy, delicious and one of the best low calorie recipe, fresh and light. 250 gram mung bean sprouts, tailed and rinsed clean. Pour hot boiled water over it if you want it still crispy. Prepare the vegetable according the instructions. Set aside. Mix the grated coconut well with the smooth paste. And steam it for about 20 minutes. Mix the coconut mixture with the vegetables and serve. Do you need some more vegetarian recipe for dinner tonight? Maybe you could try this authentic Chinese Vegetarian recipe. They are tasteful and the instructions are easy to follow. Get the free cooking tips by subscribe to the website and discover the easy to follow cooking technique to make a lot delicious low calorie vegetarian recipe.